Attorney General Bill Sorrell, Gov. 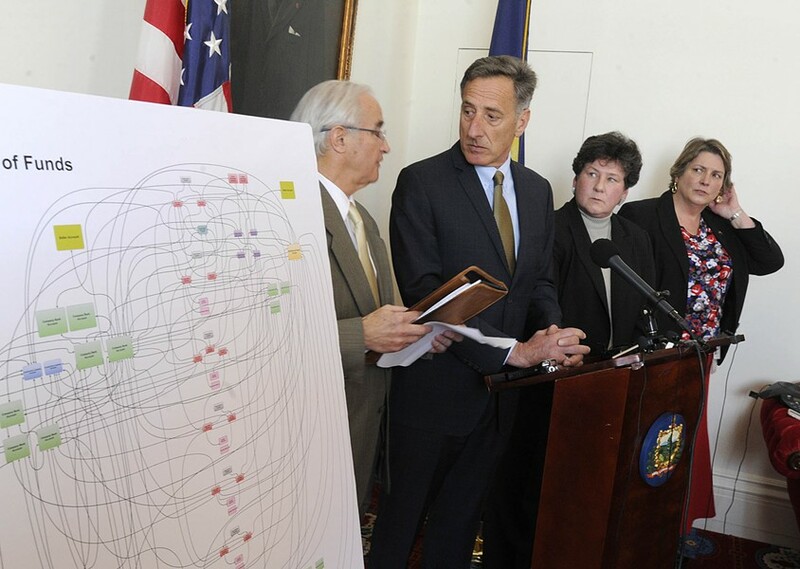 Peter Shumlin, Department of Financial Regulation Commissioner Susan Donegan and Secretary of Commerce Pat Moulton discuss allegations against Bill Stenger and Ariel Quiros Thursday at the Statehouse. A day after federal and state authorities accused a pair of Northeast Kingdom developers of orchestrating a $200 million "Ponzi-like" scheme, Vermont politicians and parties split Friday over what to do with the campaign contributions they received from the men. 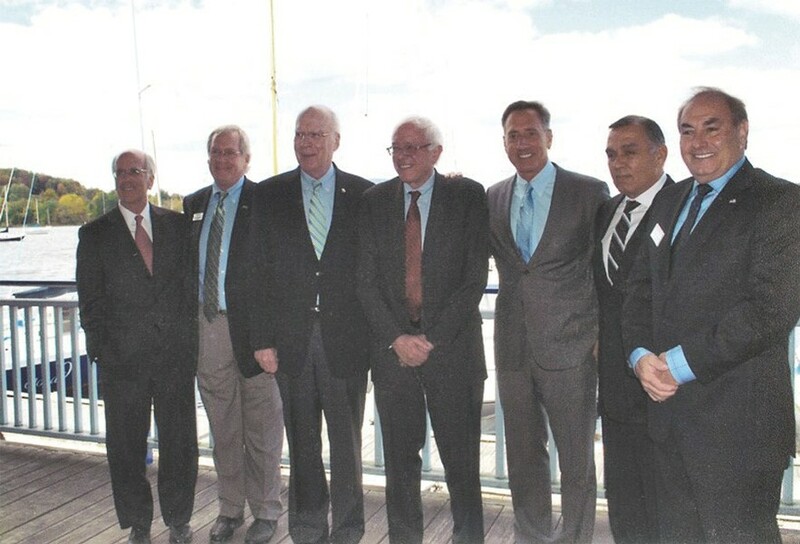 Ariel Quiros and Bill Stenger, who allegedly misappropriated $200 million worth of foreign investment, donated tens of thousands of dollars to political players in Vermont over the past five years, according to early and likely incomplete estimates. Several of those recipients appeared at investor-recruitment events staged by the developers outside the country and advocated for the EB-5 investor visa program, through which Quiros and Stenger funded their development projects. At least two high-ranking Democrats, Sen. Patrick Leahy (D-Vt.) and Congressman Peter Welch (D-Vt.) pledged Friday to donate to charity any contributions they accepted from the accused. But Gov. 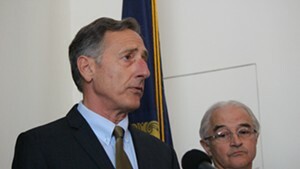 Peter Shumlin, also a Democrat, said through a spokesman that he would not. Officials with the Vermont Democratic Party and the Vermont Republican Party, both of which accepted donations from at least one of the men, said they were still tallying up the money they received and figuring out what to do with it. Meanwhile, two gubernatorial candidates — one from each party — called out those who accepted the campaign cash and made demands of their own. One of them, Democratic former state senator Peter Galbraith, said he was "saddened that so much of this largesse has gone to my own party." Galbraith, whose efforts to ban direct corporate contributions were stymied by the Vermont Senate during his two terms in office, noted that Stenger and Quiros made many of their donations through the companies they controlled. He said Shumlin and the legislature should take immediate action to halt the practice. "Gov. Shumlin has said that these corporate campaign contributions made no difference to the state's oversight, but Vermonters understandably are skeptical," he said, calling out the leader of his party by name. Republican gubernatorial candidate Bruce Lisman, a retired Wall Street banker, said Shumlin and his peers should turn over the money to the federal court-appointed receiver who assumed control Thursday of Jay Peak Resort and the developers' other assets. "Corruption doesn't belong in Vermont," Lisman said in a statement Friday. "The public trust between the people of our state and politicians leading our state has long been broken. It’s time to address these issues head on." Shumlin raised at least $12,000 from Quiros, Stenger and the companies they controlled during his 2014 reelection campaign — and thousands more during previous election cycles. His spokesman, Scott Coriell, declined to comment Friday on Galbraith's statement. In response to Lisman's missive, he noted that several Republicans — all former officeholders or unsuccessful candidates — had also received contributions from one or both of the men. "I assume Lisman is including Jim Douglas, Brian Dubie, Mark Snelling, Jason Gibbs and the Vermont Republican Party? And that you’re asking all of them?" Coriell said in an email. The spokesman said Shumlin would not return the money, arguing that it had been raised and spent in previous election cycles and that his boss was not running for reelection. Lisman's statement evidently caught the eye of his Republican rival, Lt. Gov. Phil Scott. His campaign coordinator, Brittney Wilson, tweeted a link Friday night to a September 2012 press release from Lisman's self-funded advocacy organization, Campaign for Vermont, praising "the extraordinary results of leaders like Bill Stenger." Referring to Stenger's and Quiros' plans to build $500 million worth of economic development projects in the Northeast Kingdom, Campaign for Vermont wrote, "Though the effort is substantial, and the results real, we can't fix these problems through the hard work of people like Bill Stenger alone." Like Shumlin, both Leahy and Welch took part in Stenger's investor-recruitment efforts abroad — and accepted campaign contributions from him. According to data from the Center for Responsive Politics, the developer and his wife, Mary Jane, have given at least $5,800 to Leahy and $1,500 to Welch over the years. Referring to Stenger as a "friend," Leahy said at a Friday press conference in Essex Junction that he would donate the money to "some charity in the Northeast Kingdom that would enable people's jobs." Welch said through a spokeswoman Friday that he would donate Stenger's contributions to the Vermont Food Bank. Quiros and his wife, Okcha, have given at least $32,000 to the Vermont Democratic Party during the last four years, according to CRP data. Party spokeswoman Christina Amestoy said Friday that the VDP was unaware of the alleged malfeasance when it accepted the money and has since spent it. She said she wasn't sure whether the party would donate an equivalent amount to another entity. "At this time, it's going to be an ongoing discussion within the party," Amestoy said. "This is a new and shocking revelation — and we will be discussing what our actions will be moving forward." Stenger contributed at least $2,000 to the Vermont Republican Party in 2010. GOP chair David Sunderland downplayed the amount Friday and questioned whether it would be legal to cut a check to the federal receiver, as Lisman suggested. "From the party's standpoint, it looks like, compared to the Democrats anyway, this donation is pretty small. It was several election cycles ago," he said. "I think we're still looking at what our next move will be."